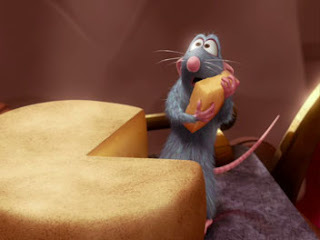 Over dinner the other night I mentioned my desire to see Ratatouille, the new animated film from Pixar and Brad Bird, the genius behind Iron Giant and The Incredibles. I pointed out that A.O Scott had nothing but raves, including the most-likely-oft-quoted "a nearly flawless piece of popular art." My dinner companions bristled at this, noting that: "The last time A.O. Scott waxed rhapsodic we ended up watching Miami Vice. We won't make the same mistake." I ended up seeing Ratatouille anyway, at the Ziegfeld no less!, and I have to say: OH MY WORD. It's a great film, full of hilarious physical comedy and foodie-ready good times. (After I saw the rat-protagonist make an omelet, I nearly fainted -- it was that realistic and gut-growl-inducing.) That's all I have to say. You all should go see it soon. Or invite me to see it with you. Whichever. You''ll love it. saw it on your recommendation. thought it was great. also thought miami vice was great too though, so take that how you will.